Yesterday's alternate count came to pass, and hopefully readers heeded my warning regarding the red trendline and protected profits. There are certain things I take for granted as "common knowledge" and I sometimes fail to expand upon certain statements for that reason. It was brought to my attention that the following annotated chart might be helpful to some readers. When I make statements like one made yesterday: "watch the red trendline for clues" -- this is the type of watching I'm talking about. The chart also contains the updated count, though I'm now on the fence as to whether it's wave 4-up or wave (ii)-up (see Dow chart) -- but it's largely irrelevant at this stage. More relevant is the fact that it's possible that ALL OF wave (y) completed yesterday, due to certain things I'm seeing in other indices (such as the Dow Industrials). Yesterday's target was 1393 -- it's possible that 1392.76 was close enough. There is a bit of confict among indices. 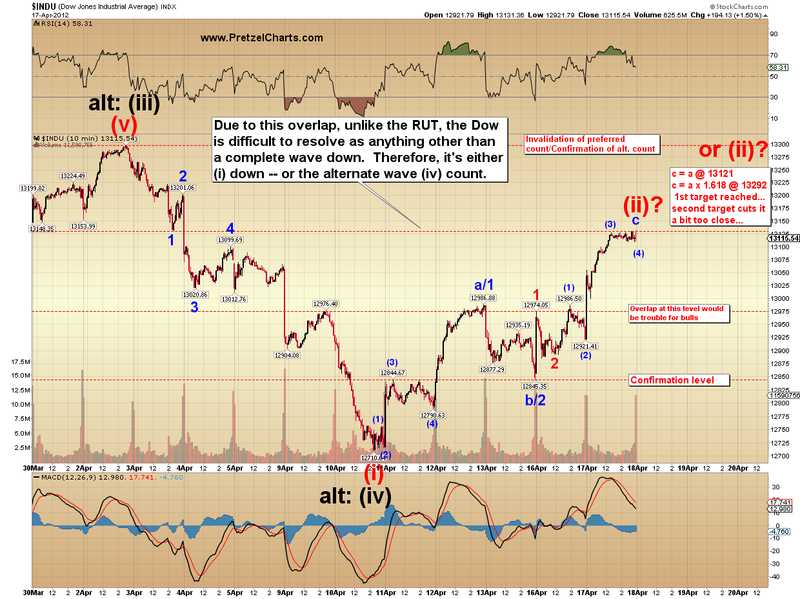 I've previously mentioned the RUT and how it doesn't count well as a complete five-wave move down. Here's that chart again, along with the updated count. 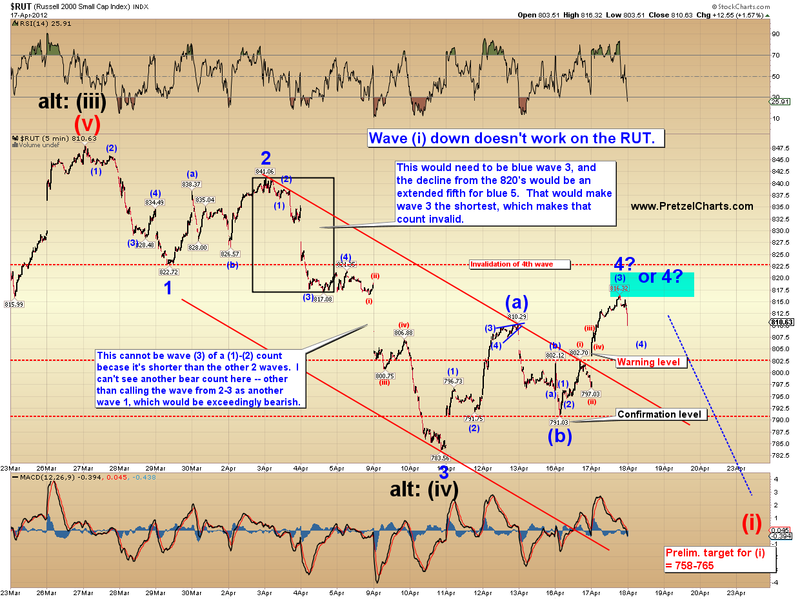 So the RUT appears to be in a fourth wave correction (or starting a new leg of the rally). Contradicting the fourth wave interpretation is the Dow, which does count best as a complete five-wave move down. If the current rally remains as a corrective 3-wave move, then that makes the rally a larger second wave up. Which means, if that interpretation is correct, then a big sell-off should follow in the third wave down. Basically, the big challenge now isn't about whether the rally is a fourth wave or a second wave -- because both of those lead to lower prices. The big challenge is whether it's a corrective wave (of some variety) or the start of wave (v) up. The knockout level for the corrective rally (which ultimately leads to new lows) is the previous yearly high. It's not really possible to definitively sort one count from the other at this stage, because the rally has formed only 3-waves up so far. So it could be a-b-c (or w-x-y), or these could be the first 3-waves of a new impulse up. I'm continuing to favor the more bearish count by a slim margin for the time being, largely because the first portion of the rally in SPX counts much better as a 3-wave rally, which suggests that the entire rally is corrective. But here's one thing that can't help but bother me: the conundrum between the RUT and Dow can be resolved -- if one counts the RUT as a 4th wave (an a-b-c) down. So the counts all work together just fine and dandy if we count the decline as a fourth wave with wave five up still to come. Now, this isn't to say that they don't work when counting them more bearishly -- if they didn't, I would throw the bearish count out. But it's a little cleaner factoring everything together if we count the decline as a correction. So maybe that's the answer -- but I'm not ready to see it? Maybe you are -- I'll leave it to the reader to decide. The market rarely makes this easy. I've marked a number of levels to watch on the various indices which should give us some clues. Basically, if this is a corrective rally, it needs to remain as a 3-wave form. Overlap at certain levels would help to guarantee that. In conclusion, there's nothing in the charts right now to rule out either count, and both remain quite viable. Based on the current overall appearance of the structure, it looks pretty good and counts very well as a corrective rally with new lows to follow. I remain in favor of this interpretation for that reason. If that's correct, and this is a 2nd wave rally, then the market should be on the verge of a strong sell-off. Conversely, and running in complete opposition, the more bullish count would have the market on the verge of a strong rally (since it would view the rally as a nest of 1's and 2's). Preliminary targets for the rally interpretation would be in the SPX 1450-1470 range. The one thing that seems fairly certain is there's a strong move coming soon enough, one way or another. We should be able to sort those two options out over the next few sessions, by keeping an eye on the key levels. Trade safe. Hello, I must be leaving. Off to work. Thanks for the RUT update, PL and G'luck to all. So far, DX ran into a brick wall at .970. We'll see if they make another run at it later. Phil Collins beat ya to it. Question: when placing stops around a trend line is there a good rule of thumb for where to put them such that on aggregate you don't get bounced out by a headfake and still limit risk? I'm obviously just learning and I'd appreciate some wisdom (as opposed to advice) from you veterans. thanks again! Unfortunately, there's not an easy answer (that I can think of, anyway) to that question because it varies greatly by situation and market position. Thanks. Added "see Dow chart." Spanish bond auction tomorrow. It will be a market making, or breaking, event. 1. The US market tickers are distorted metrics of social mood due to aggressive intervention. The wave shapes may be the same, but their position and degree in the bigger picture is distorted. No wonder people don't have any idea what could happen next. If you rely on US tickers for a big wave social mood road map, you don't know where you are. 2. Intervention does not change the actual social mood score. It just changes what's written on some of the scoreboards. 3. The GDOW and Forex pairs are less "interventionable" and therefore more likely to reflect actual social mood. 4. Those metrics indicate (if you're in the P3 camp) that the P2 top is in (and was back when everyone thought it was), and we very likely just had the Intermediate 2 of P3 top, and Intermediate 3 of P3 is beginning. (We are in the first Minor degree stages of Intermediate 3 down of P3 down). So what's likely is that there is MUCH downside ahead. Interestingly, the GDOW is struggling to reach the 38.2 Fib retrace. It got above the 23.6 twice and sort of fizzled. And we've got an 80/10 sma cross on the daily on the GDOW. If this means what I think it mean, 3-of-3 social mood is weighing heavily on things already. Watch for big surprises to the down side. Disclaimer: I'm biased, due diligence, manage risk, small parts are choking hazards, don't use electrical devices in the tub, replace filter often. G'Morning PL. Excellent post...nice and concise...I put on some skimpy pre-market $RUTting shorts with a tight jock stop just in case it starts $RUTting in the wrong direction. Good luck to all. DX is getting ready to make a decent move. It's doing its best to whipsaw everyone here. Wouldn't be surprised to see one more fake-out lower before it rallies for real -- assuming that it's going to rally, of course. That's my best-guess read, though. But it's so much faster to dry my hair with the hairdryer while I'm still *in* the tub! Actually, I have a great, and totally irrelevant (to the market) story along those lines. I consider myself a reasonably intelligent person, but maybe a decade and a half ago, I was out back at my old house doing some yardwork, and the only way for me to reach a cetain hedge that needed trimming was to place my ladder in the above-ground pool. So I did so, and proceeded to start trimming.... at which point, I glanced back and realized that the male-female connection of the trimmer plug/extension was dangling about 2 feet above the water while I trimmed... and the ladder was aluminum.and half-submerged in the pool. Fortunately, I realized this before electrocuting myself... but it was definitely one of the "OMG was THAT stupid!" moments. PL.....top of the morning to you. If you have some free time during the day and could cast your EW eyes across this chart...I'm wondering if this is a plausible count? A completed a-b-c.
(which ultimately leads to new lows) is the previous yearly high." and in the DOW chart you indicate that a possible target for the current upward wave could be 13292 which is wave a*1.618. If this target is attained, wouldn't this be considered as a "knockout level for the corrective rally" since it would have breached the yearly high in the DOW. One of your best PL. Thank you for taking the time to educate with chart 1. You clearly explained the 2 options on the table, well done. The reality is that a reader must become familiar with the essentials of EWT to follow the details you explain so well. After following you for a year I could follow your logic without hurting myself. I applaud those that have taken the time to study the subject. No, because the yearly high = 13297. But that's why I noted the target cuts it "a bit too close." I don't think this adheres to the rules, but I'm liking 3/19 as the technical top (see EWG, XLF, VTI), 4/2 high (1422) is simply a wave 2c high, and the week of April 2 is the 3rd wave down. We've been in a w4 since that interim low. There are 1/4 overlaps and other issues, but my work says we likely have at least another retest of the lows for this move down ahead (and so neither wave v up nor wave 2 up has started yet), so there is some sort of challenge to the highs also still ahead in the weeks to come. PL...your articles *are* all winners if folks are getting a bit more understanding with each of them...I know I am. When it comes to me, remembering the "idiotic" things I've done (even though I am quite sane), I marvel that I am still alive. I should have been toast at least three times in my life. Glad you're still with us PL. I am very frustrated. I am limited to 3 day trades/rolling 5 trading day period. That is why I had those positions overnight in the first place. I can't blame that alone - I knew my limitations and I took a stupid risk. Part of me says I should sit out the market and save up to the 25K where I am not hamstrung, but that will probably take me more than a year, if I am really good. I plan on limiting myself to one trade at a time, looking for big intraday turns. And for Pete's sake, I read this bloke's blog every morning, can't I listen to his advice? ;-) thanks big guy. I can't say it enough "truly, you have a dizzying intellect"
Morning. US$ broken the .95 and backtested it - fail brakout? Add me to the group that appreciates each and every article for the educational value. Today's post has a great deal of instruction, especially since it's not clear cut or easy. It takes hours on my own to assimilate what is being presented, but there is a great deal of satisfaction at the end. Thanks for your diligence, PL. 1 2...1 2 up from the September low? Morning PL. hope you got some decent sleep. I'm seeing that spx broke through the support level at 1386ish but now is hanging around that level...making me a liitle nervous that the market wants to move up. Anything else I should be looking at? Stan Weinstein's "Profiting in Bull and Bear Markets" is the best one I've read, but I don't know if it is still in print. Appears to be shaping up to be w4 down hit and the w5 up underway in 'y', like a magnet toward that blue box. It's fascinating to see this EW stuff come to life for myself and not view the market as something completely random w/ no idea or clue as to what can happen next. chance of a drop from this point forward in ES, morning opening BS may be finishing up. . . If so this should begin within an hour and if this starts it may very well carry through into the ROD. If you trade futures, there's no limit to how many trades you can execute regardless of your account balance. You have to police yourself *hard* with the leverage though, and not over-do it. But something to consider for those hamstrung by the 25K limits... you can even trade futures on a lot of individual stocks. I'm thinking about it. At worse, it'll force me to learn about another important market. Not going to decide today. Begs the question: how could so many act in concert, all these years, and not know it! So far, just a 3 wave rally off the lows. Back below 1385 and new lows are almost guaranteed. If it goes above 1388.34 first, then the next leg up may be underway. You're talking about the day trading restriction? I doubt that's a product of evil investment bankers. They'd probably be perfectly happy with people with baby accounts trying to day trade. I think it's our benevolent overlords in the federal government trying to protect me from the evil investment bankers. "another small wave up to tag high 104's or 105's" would breach the 3/23 wave 1 low of $104.85. Now I'm concerned! Thanks, much. Broke 1389...I am watching tick by tick. This is definitely addictive. Yes, I've considered both of those. Ending diagonal doesn't quite look right, the lines are a bit too parallel -- could be the early stages, though. I was looking at this and see the stochastics are very low and crossing up on a 1 & 2 year chart. Perhaps this lends credence to the argument that April 10 was the w4 finishing and this is a w5 up, bolstering the bull view. should be a big red down candle coming very soon (within next 1/2 hour?) to validate my call down below. . . This is how and where a potential sell off should start to allow time to carry thru into the ROD. Thinks: drop from top 5days, rise from 1,357 6 days, retrace = 50% or so, the most slugggish 6 days in the whole structure. Tired market or coiling waiting to spring higher? AND, there is still that gap to fill at 1,404.7 (top), and SPX fills it's gaps. Also, the Stochastic MI is still way below a sell level. Looks a good 'up' day. IMHO. 1388.34 hit. Off to tthe races? sorry for the stupid question, but what is ROD? rest of day i believe..
Could be, but the bear alternate Pretzel presents above is just as likely at this point IMHO, so hang loose. There tends to be a seasonal top about this time of year. You're right, ending diagonal doesn't look right at this point, but you're also right, it's early if that's what's going on. EPA WILL DELAY START OF U.S. FRACKING RULES UNTIL '15, API SAYS" on bloomberg. Anyone long crude futures? Dollar's whipsaw city today. Dollar bulls need to stage a rally here, to keep the decline as an a-b-c.
Great call Katzo, right on time. downside target 66es? Skin of your teeth, I think you had maybe 10 seconds left in your half hour call. :-D amazing dude.
? CVX already had a passable 5-waves down. Hard to reconcile every little squiggle in that chart right now -- but it's an individual issue, not an index. You have to give the structure more leeway due to less volume. I was thinking the same thing earlier in the week. But didn't the Tuesday auction go OK.
SPX rally looked corrective seen in total... decline looks impulsive. FYI.....doesn't look like a lot of support here. Elevator going down....floor please? Sorry, I was busy playing Max's game. I got 66 right, lol. The Disqus comments from the last few days are all streaming in at once now. Very confusing. Gotta love Disqus! Not talking about trading restriction. Referring to your last sentence in your post! Good job on your game. #7 stopped me in my tracks. Sorry...pressed the button marked "China Syndrome".....hope you don't mind? I'm still waiting for mine to come in the mail. high volume es 82.50 81000 cars where is the hot knife? It seems like yesterday's $RUT just filled the gap from 4/5 and slammed on the brakes, an "easy play" once the ball got rolling. Took a lot of people's money. I wouldn't let him drive today LOL....I see a lot of "Bat turns" occurring. on back order, should arrive late 2014. Be patient. SP intraday chart looks a lot like daily from Dec to early April. 3P & D complete with Sine wave. I am watching the apparent neckline on the inverted HS pattern under development. $RUTs running between Fib's....I love those things. It is coming from China after all...I knew I shoulda paid the extra buck for same-year shipping. LOL, actually not obscure at all. It's what I was referencing :) Although, I flubbed it up with "leaving" instead of "going". Nice that you got it. I am wondering if this is a wait until we see the results from Spain sort of day? Tom Sawyer just fascinates me...incredible drumming. looks like head n shoulder top on my es 5min from premkt close low on 5min. needs to get below 80.50 or so with force? or the 5min close trendline holds there at 80.50...............if she breaks may get some impulse down? Like a squirrel on the road between two oncoming cars. I get some of my best "retreads" that way! Looks to be a nice triangle forming on the spx...which way will it break? If anyone gets a chance let me know if you believe this be an acceptable way to label this chart. Thanks in advance. Amazing syncopation at that speed. Looks convincing....macd pointing to wave three and then non-confirming wave 5. Plot your ratios against the chart prices and then post again. 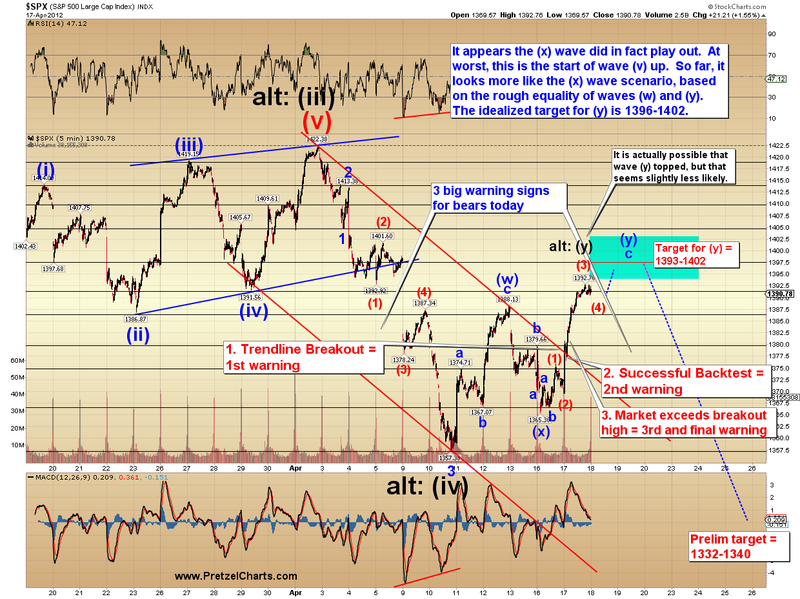 market is starting to get that 3 wave overlap look here like it wants to make a diagonal .... LD down coming?? Bob, you'll have to forgive me as I'm learning all of this on the fly. What ratios are you speaking of? I'm not sure of the best way to do the labeling, etc. since I copied that image and had to drop it into MS Paint, that's probably the old school turtle way I'm guessing. On it's face, it doesn't break any rules, but the fractals also need to work. 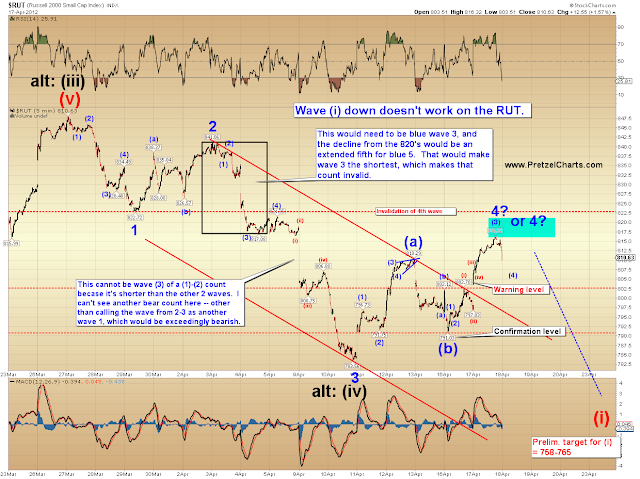 PL has mentioned many ratios in his posts as well as others mentioning a 62% , or 50% correction of wave 1...etc. Can't learn the basic from an advanced blog like PL's. Gotta come here knowing most the basics. I do understand the Fib ratios, I thought you were speaking of something different. Thanks. classic update PL, though honestly I liked yesterday's update even more since it was so brief, concise and to the point. Anyway, I figured I'd throw in a little Bollinger Band study for the SPX. I know it's only mid-day, so a lot can happen between now and the close, but it's more about the principle of using BB's to see how the market's doing. I've plotted three BB's: in blue the "typical" 2 standard deviations (of the 20d-SMA); in red with 1-Stdev, and in green with 0.5-Stdev. The smaller the stdev, the closer they upper and lower bands get to the midband (20d-SMA). Different BB's can give a good indication of trend continuation or trend-change. For example, the whole run up from late December '11 through early April, prices were nicely sandwiched between the 2-stdev and 1-stedv upper bands, except for the 2 corrections late Jan' and early March (4th waves at some EWT degree). However, prices always came back very quickly into that 1-2 band: trend continues. What we are seeing now is that prices fell first through all bands, didn't even close above the 2-stdev 5 trading days ago, and are now "stuck" between the mid band (20d-SMA) and pretty much the lower band of the 0.5stdev. Prices need to move out of this range (either up or down) to confirm any trend. I hope this helps and adds to anybody's TA's tool kid. BB's can be great to identify trends, trend change or trend continuation. I stumbled on your site last Friday and I have to say that you rock. Amazing accuracy!!!! I started learning EW last October. Great place to start I thought. Wave 1: Oct low to Oct high. After that there was 5 waves down, so that threw me for a loop. I read that a new count was in order from 1159. I saw Wave 1 (1159 to 1267), Wave 2 (1267 to 1202), Wave 3 (1202 to 1378), Wave 4 (1378 to 1340), and a weird Wave 5 (1340 to 1414 or 1422). I even saw 5 subwaves for wave 3 and 5. I thought that this stuff is easy. What's the big deal. Next, I figured that an ABC corrective wave was in order. I thought that the end of Wave 4 was a minimal target (1380), but 38.2% and 50% retracements were at 1320 and 1292 so they could be good targets as well. 1292 is the Wave 1 high of the last 5-wave impulse. Wave X can be any correction pattern, except an inverted broadening triangle.Wave X is smaller than wave W.Wave Y must be a zigzag pattern.Wave Y is, at minimum, equal or bigger than wave X.Wave X² can be any correction pattern, except an inverted broadening triangle.Wave X² is smaller than wave Y.Wave Z must be a zigzag pattern.Wave Z is, at minimum, equal or bigger than wave X². What the hell is X "squared"? Y = 1365 to 1393? (28 points). Wave X² is smaller than wave Y.Wave Z must be a zigzag pattern.Wave Z is, at minimum, equal or bigger than wave X². they arnt getting many sellers down here!!! Bob_E, since stocks rise going into earnings, do you think that will effect CVX? I believe they report next week. Volume today so far is lower than yesterdays light volume rally. Perhaps evidence yesterday was a short squeeze, and bulls haven't jumped on for the bull trap? Could indicate bulls are tired of this **** and just want to go home? Pure speculation. Bears are flogged, bulls are flogged - no one wants to do nothing. Im happy I took a break for lunch. Looks like it broke up, then retested just below 1386, held, started heading up again (at which point I might have gone long), only too see it falter and move back to the lows for the day. Look like the lows held. Where is Katzo for his EOD call? Makes total sense.....question: have you done any calcs on the target price for CVX? I try to set aside news....really hard to do, but I try. With that in mind....the calcs on CVX are thus: I think it has put in wave 4 and headed down for wave five below $100.51. The measured moves are (5 equals wave 1 then $96.66) (618 of 0-3 then $96.82) (382 of 0-3 then $99.60). The indicators I watch suggest a wave 4 and as long as it doesn't breach $105 approx, I think I'll be right. BTW....Tough typing with my fingers on both hands crossed...gonna have to get a voice activated keyboard. very nice. thanks for sharing S.S.
Did you see that I was asking for your EOD call? Or was this just a happy coincidence? What do you think of this chart for VXX. It works with a ramp up today and into tomorrow - then the start of 3 down. I was thinking tomorrow may be a decent time to short anyway. 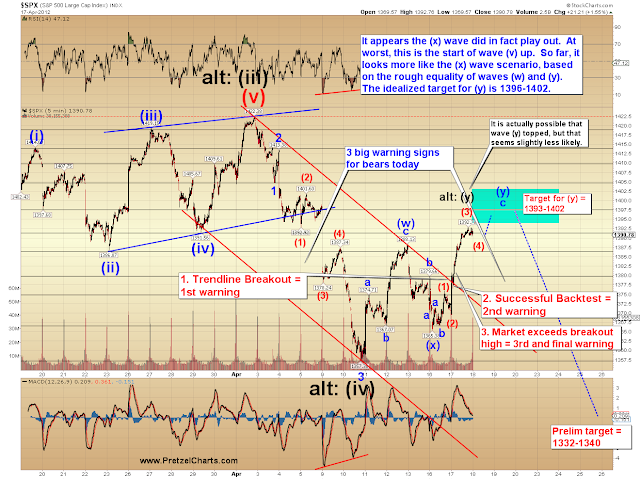 If this wave is heading to new highs then 5 of 1 up should end tomorrow with a sharp correction 2 down. If its the end of C then Wave 3 down will be starting. a happy ending... and is there a better kind?! Great post PL. I don't actually think I've ever heard trendline breakout rules explained that succinctly or if I had I've forgotten. Either way I wrote it down in my notebook and saved the chart when you posted it in the comments last night. Thanks for the tip. I've gotten burnt too many times by holding thru earnings, and I don't think any amount of technical analysis can predict what will happen when the numbers come out. There are 9 days left until then, but I just wonder if CVX might go up until then and then continue down depending on what happens with earnings. PL or Katzo, or anyone else, what is your experience with how an Elliott Wave lines up with an earnings release? Does it support it or is it a toss up? Says he thinks the bounce in the market could be explained by his target date of April 19 being a high.Thinks it is safer to be on the sidelinesThere are no signals to go shortA close above 1391, 2730 and 13200 could still lead to a test of 1449He is in cash. I just realized one reason why silver could be making a comeback as an industrial metal (as some would have it): Reduction of Hazardous Materials (ROHS), to wit Lead, as in Lead based solder. Here's AAPL ie the King. All markets bow before it. Ichi Moku chart. The Spanish GB auction should go well, unless "they" don't want it to. Yahoo home page headline.....must be another new word. I think 40 watts should just about do it. We're not talking jeweler's silvers solder (for that I have a torch). But my 30 watt iron will just barely melt ROHS-compliant electronics solder. tgt of 91 not realized, both my up and down calls were failures, sideways crap. look at the 15 minute ES, nothing there to trade. thanks B_E for Nenner, bit of a big ask yes, all those new highs.? do you yourself have a view SS based on your experience with BB? Be good to know. Katzo, look at my post about 41 minutes ago and tell me your thoughts. Thanks! I still think there is a market new high before the elections here in the States. Now I don't think many will participate but let me lay this scenario on you. From here we have a meaningful decline to the 1340 area (front running the sell in may and putting in wave 1)...there it stabilizes and works sideways thru May-June. Then happy hour arrives and we rally smartly back up to the old highs, perhaps even breaching them prior to the elections. I think HPQ could be one of those that help the markets get back up and attract the moths to the flame. here's what's got me confused about direction... i could argue the move up off the open was a leading diagonal (LD A) - and the late afternoon spike was wave C of a corrective up. looking at the futures -- you can make the argument for a clear impulse down...followed by said ABC correction in the up direction during the day.